the man Christ Jesus, who gave himself as a ransom for all." Christ sent the Holy Spirit at Pentecost to inspire his Apostles and his Church to shepherd his flock after his Ascension into heaven. "As the Father has sent me, even so I send you" (John 17:18, 20:21). Jesus is the Head of his Body the Church (Colossians 1:18). The Church itself is a sacrament instituted by Christ to give grace. Jesus gave us his Body the Church to continue the works he performed during his earthly life. Grace given to us through the sacraments will help us lead a good life in this world and help save us for the Kingdom of Heaven. The sacraments were instituted by Christ and were part of the Tradition of the early Christian Church. The Church celebrates in her liturgy the Paschal mystery of Christ, his Passion, Sacrifice on the Cross, Resurrection, and Glorious Ascension. The Greek word μυστήριον or mystery in the Greek New Testament is translated into sacramentum in the Latin Vulgate Bible, from which we derive our English word sacrament (examples: Ephesians 1:9, Ephesians 3:9, Colossians 1:27). The saving effects of Christ's Redemption on the Cross are communicated through the sacraments, especially in the liturgical celebration of the Eucharist. The sacraments to this day are called mysteries in the Eastern Churches. Catholic as well as Eastern Orthodox Churches all recognize the seven sacraments of Baptism, Confirmation, Holy Eucharist, Penance, the Anointing of the Sick, Holy Orders, and Matrimony. 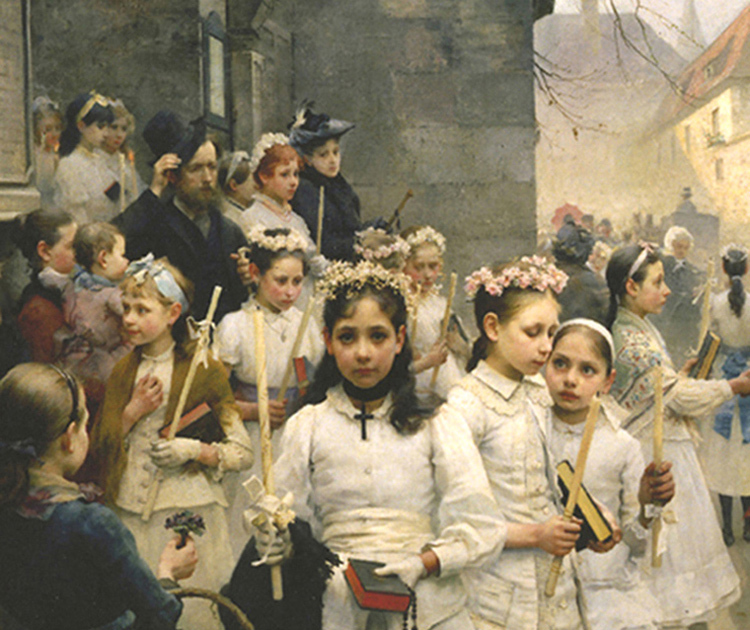 The three sacraments of Christian Initiation are Baptism, Confirmation, and the Eucharist. The two sacraments of Healing are Penance and the Anointing of the Sick, and the two sacraments of Vocation are Holy Orders and Marriage. Three sacraments, Baptism, Confirmation, and Holy Orders, are given once, as they render a permanent seal or character upon one's soul (2 Corinthians 1:21-22, Ephesians 4:30, Revelations 7:3). Each sacrament consists of a visible external rite, which is composed of matter and form, the matter being the action, such as the pouring of water in baptism, and the form being the words spoken by the minister. Each sacramental rite confers a special ecclesial effect and sacramental grace appropriate for each sacrament. The sacraments occur at pivotal events and give meaning to a person's life. Grace is a favor, the free and undeserved gift from God through Christ Jesus, to help us respond to his call to become children of God, to become partakers of the divine nature and of eternal life. Our justification comes from the grace of God. Grace is a participation in the life of God and is necessary for salvation. This page will include a brief introduction and some Scriptural sources for each Sacrament. Baptism is the basis of the whole Christian life, as we are born of the water and the Spirit and receive the grace of Christ. Baptism is necessary for salvation (John 3:5), and conveys a permanent sign that the new Christian is a child of God. Jesus himself was baptized in the Jordan River by John the Baptist (Mark 1:9-11). The martyr St. Ignatius of Antioch, in his Letter to the Ephesians written about 100 AD, stated that Jesus "Christ was baptized, that by himself submitting he might purify the water." Baptism is prefigured in the Old Testament through the saving of Noah and his family during the Flood (Genesis 7:12-23, 1 Peter 3:20-21), and Moses crossing of the Red Sea during the Exodus, leaving captivity for the Promised Land (Exodus 14:1-22). and of the holy Spirit, teaching them to observe all that I have commanded you." Or are you unaware that we who were baptized into Christ Jesus were baptized into his death? Confirmation (or Chrismation) is the Sacrament of the Holy Spirit, the Holy Spirit whom Christ Jesus sent (John 7:37-39, 16:7). Jesus instructed his Apostles that "you will receive the power of the Holy Spirit" and called upon the Apostles to be his "witnesses" to the ends of the earth (Acts 1:8). At the Pentecost, the Apostles were filled with the Holy Spirit (Acts 2:1-4), and began to spread the Word of God. The Acts of the Apostles is often called the Gospel of the Holy Spirit. St. Cyril of Jerusalem wrote of Baptism, Eucharist, and this sacrament in the mid-fourth century AD. "While Apollos was at Corinth, Paul passed through the upper country and came to Ephesus. There he found some disciples. And he said to them, "Did you receive the Holy Spirit when you believed?" And they said, "No, we have never even heard that there is a Holy Spirit." telling the people to believe in the one who was to come after him, that is, Jesus." and they spoke with tongues and prophesied." Eucharistia means thanksgiving, and the Eucharist is the "source and summit of the Christian life." St. Justin Martyr described the Eucharistic Liturgy in 155 AD in his First Apology. The Paschal mystery of Christ is celebrated in the liturgy of the Mass (or Divine Liturgy in the East), which consists of the Liturgy of the Word and the Liturgy of the Eucharist. The Eucharist is the principal sacramental celebration of the Church, established by Jesus at the Last Supper, in which the mystery of our salvation through participation in the sacrificial death, Resurrection, and Glorious Ascension of Christ is renewed and accomplished. The word "Mass" comes from the Latin missa, as it refers to the mission or sending forth of the faithful following the celebration, so that they may fulfill God's will in their daily lives. 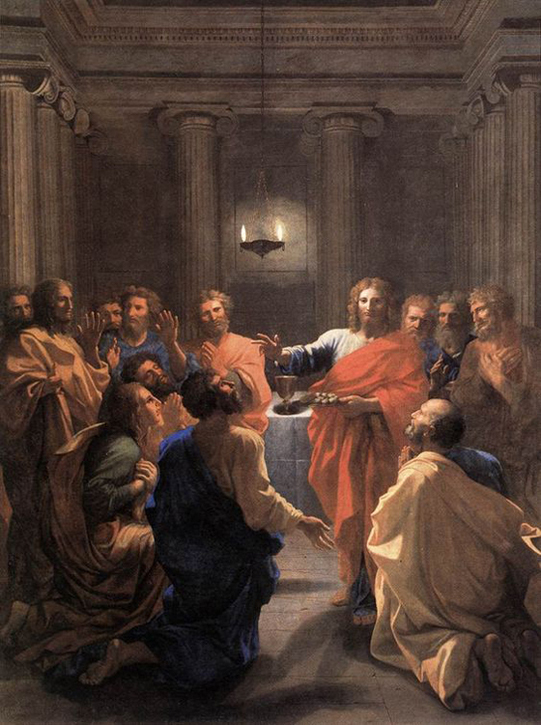 The essential signs of the sacrament are wheat bread and grape wine, on which the blessing of the Holy Spirit is invoked during the Sacrifice of the Mass, and the priest pronounces the words of consecration spoken by Jesus at the Last Supper: "This is my body...This is the cup of my blood..." (Matthew 26:26-28, Mark 14:22-24, Luke 22:19-20, First Corinthians 11:23-26). Jesus died once on the cross in sacrifice for our sins (Hebrews 9:25-28). But Jesus is present for all time, as he is the eternal Son of God. What he did once in history also then exists for all eternity. What happened in time goes beyond time. In the heart of Jesus he is always giving himself to the Father for us, as he did on the Cross. When we celebrate the Mass, the sacrifice of the cross, that happened once in history but is present for all eternity, that same reality is made present in mystery. "This cup is the new covenant in my blood, which will be shed for you." The penitent confesses his sins to the priest in the confessional, and the priest then gives absolution to the repentant soul, making the Sign of the Cross, and saying the words " I absolve you from your sins, in the name of the Father, and of the Son, and of the Holy Spirit." It is Christ Jesus through the priest who forgives your sins. As the penitent must make restitution or satisfaction for his sins, the priest gives a penance to the forgiven one, usually prayer, fasting, or almsgiving (I Peter 4:8). he said to the paralytic, "I say to you, rise, pick up your mat, and go home." "Jesus said to them again, "Peace be with you. As the Father who sent me, even so I send you. "Receive the Holy Spirit. If you forgive the sins of any, they are forgiven. If you retain the sins of any, they are retained." who has reconciled us to himself through Christ and given us the ministry of reconciliation." Origen of Egypt in his Homilies on Leviticus described Anointing for healing the sick and forgiveness of sins in the third century. St. Thomas Aquinas stated that Extreme Unction, as the Anointing of the Sick was once called, is "a spiritual remedy, since it avails for the remission of sins, and therefore is a sacrament" (James 5:15). The ecclesial effect of this sacrament is incorporation into the healing Body of Christ, with a spiritual healing of the soul, and at times healing of the body. The sacramental grace helps us to accept sickness by uniting ourselves to the passion and death of Christ (Colossians 1:24) and the grace even to accept death if that is God's will. Jesus healed the blind and the sick, as well as commissioned his Apostles to do so, as in the following sources. "And He summoned the twelve and began to send them out in pairs, and gave them authority over the unclean spirits. ... So they (the Twelve Apostles) went off and preached repentance. I complete what is lacking in Christ’s afflictions for the sake of his body, that is, the church." and if he has committed sins, he will be forgiven." which He purchased with his own blood." with the laying on of hands by the presbytery. to offer spiritual sacrifices acceptable to God through Jesus Christ." Jesus stresses the significance of the marriage bond in his Ministry (Matthew 19:6, 8). The importance of marriage is substantiated by the presence of Christ at the wedding feast of Cana, where he began his public ministry at the request of his mother Mary by performing his first miracle (John 2). It is the Apostle Paul who calls matrimony a great sacrament or mystery, and who identifies the marriage of man and woman with the unity of Christ and his Church. The theologian Tertullian, the first Latin Father of the Church at the beginning of the third century AD, wrote on the Sacrament of Matrimony. "Have you not read that He who made man from the beginning made them male and female?" "Husbands, love your wives, even as Christ loved the Church." "This is a great mystery, but I speak in reference to Christ and the church. Courtesy of Father Giles Dimock OP, Director, Dominican House of Studies, Washington, D. C.
1 Fr. Giles Dimock OP, Dominican House of Studies, Washington, D. C. The Sacraments. Lectures, Franciscan University, Steubenville, Ohio, 2001. 2 Navarre RSV Bible Series. Four Courts Press, Dublin, Ireland, 1999-2005. 3 The Catechism of the Catholic Church. Second Edition. Libreria Editrice Vaticana, 2000. 4 St. Thomas Aquinas. Summa Theologica, Third Part - The Sacraments, translated by the Fathers of the English Dominican Province, 1912; Christian Classics, Allen, Texas. 5 Pope John Paul II. On the Eucharist in its Relationship to the Church. Encyclical Letter of April 17, 2003. Pauline Books and Media, Boston. 6 Second Vatican Council. Lumen Gentium - Christ is the Light of the World. Pauline Books & Media, Boston, November 21, 1964. 7 Pope John Paul II. The Theology of the Body. Pauline Books and Media, Boston, 1997. 8 Henri De Lubac. The Splendor of the Church. Editions Montaigne, Paris, 1953. Ignatius Press, San Francisco, 1986, 1999. 9 Joseph Cardinal Ratzinger. Called to Communion: Understanding the Church Today. Ignatius Press, San Francisco, 1996. 10 Pope Benedict XVI. Church Fathers. Libreria Editrice Vaticana. Ignatius Press, San Francisco, 2007.